In Season NOW: Butternut & Acorn Squash at your local Farmers Market! To m e, this is the quintessential “Thanksgiving” dish. I find it satisfies a patriotic distant connection to our country’s pioneers, as I imagine the residents of New Amsterdam (before it was New York) relishing the bounty of their New World. 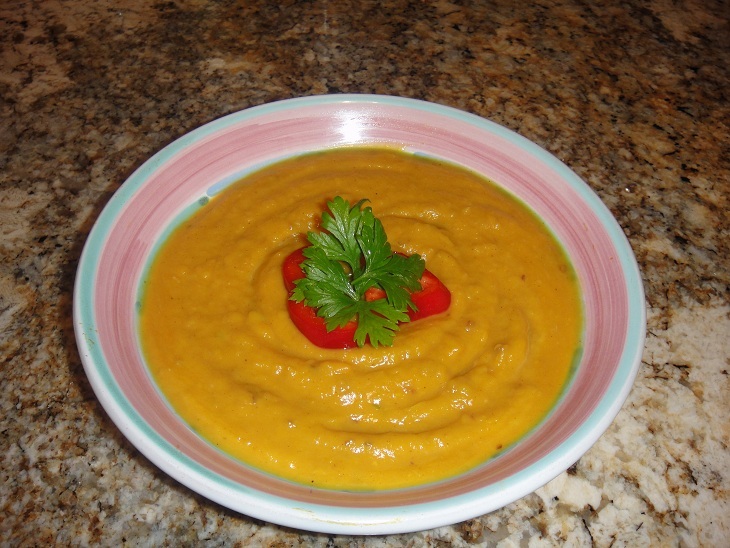 I’ve daydreamed and developed this version of Squash Soup over many crisp autumn seasons. Its spicy aroma of pumpkin pie will fill the air but won’t fill you up on an overloaded calorie count. And the dairy-free substitution of Coconut Milk instead of traditional cream and butter supplies an extra “Thanksgiving” for the Planet as well. Cut Squash in half lengthwise and place cut side up on baking sheet along with the Yam and Garlic. Bake 30 to 45 minutes until fork tender at 375 degrees. Meanwhile, gently simmer the Onion, Cauliflower and Apple in large stockpot with 1/2 inch Water until tender. Scoop flesh from baked Squash (avoid seeds), smash Yam, and add to pot with other veggies. Squeeze in 3-5 roasted Garlic cloves from their skins and add Coconut Milk and Spices. 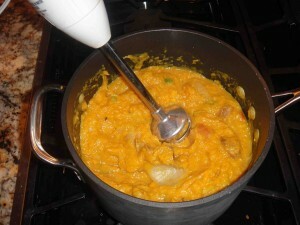 Use an Immersion Blender and puree to desired consistency, adding extra Coconut Milk or Water as you go. Check and adjust Seasonings and Spices to taste. Re-heat, serve and enjoy!